In this new book, David Harvey seeks to determine what is meant by the term in its different contexts and to identify how accurate and useful it is as a description of contemporary experience. David Harvey is Professor of Geography at the Johns Hopkins University. From 1987 to 1993 he held the Halford Mackinder Chair of Geography at Oxford University. His previous books include Social Justice and the City, The Limits to Capital (available in the USA from the University of Chicago Press, and elsewhere from Blackwell Publishers, UK) and The Urban Experience (available in the USA from the Johns University Press, and elsewhere from Blackwell Publishers, UK). 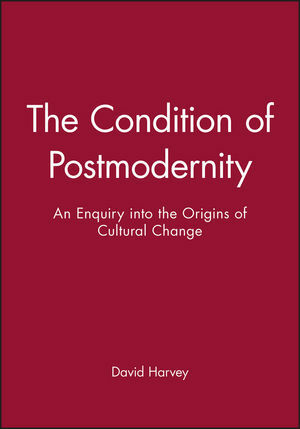 Part I: The Passage from Modernity to Postmodernity in Contemporary Culture: . 4. Postmodernism in the City: Architecture and Urban Design. Part II: The Political-Economic Transformation of late Twentieth-Century Capitalism: . 9. From Fordism to Flexible Accumulation. 11. Flexible Accumulation - Solid Transformation or Temporary Fix?. Part III: The Experience of Space and Time: . 13. Individual Spaces and Times in Social Life. 14. Time and Space as Sources of Social Power. 15. The Time and Space of the Enlightenment Project. 16. Time-space Compression and the Rise of Modernism as a Cultural Force. 17. Time-Space Compression and the Postmodern Condition. 18. Time and Space in the Postmodern Cinema. Part IV: The Condition of Postmodernity:. 19. Postmodernity as a Historical Condition. 21. Postmodernism as the Mirror of Mirrors. 22. Fordist Modernism versus Flexible Postmodernism, or the Interpenetration of Opposed Tendencies in Capitalism as a Whole. 23. The Transformative and Speculative Logic of Capital. 24. The Work of Art in an Age of Electronic Reproduction and Image Banks. 25. Responses to Time-Space Compression. 26. The Crisis of Historical Materialism. 27. Cracks in the Mirrors, Fusions at the Edges.